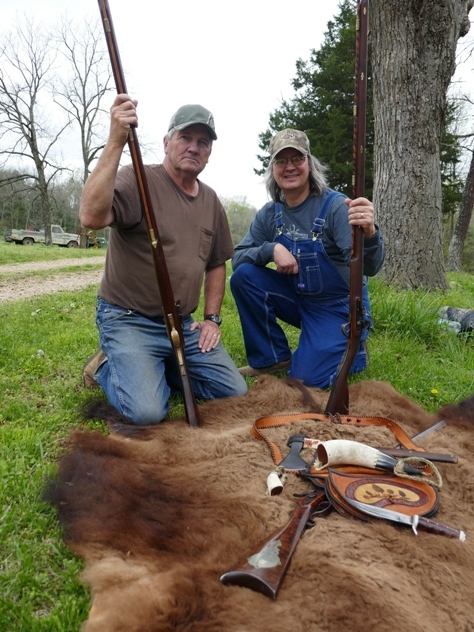 A couple of years ago, I became acquainted with Joe Hollingshad who owns Devil's Backbone Outfitters near Dora, MO. I met him through a mutual friend, Bill Cooper, and was originally invited to his place to kill a deer with my longbow while Bill filmed it. Well the deer didn't cooperate but Joe and I hit it off first thing. He's an avid black powder shooter and likes to play dress up like me so we had a lot in common. His big claim to fame, though, is turkey hunting. Joe has guided turkey hunters for decades and used to work for some of the big names in the business. Joe called me a couple of months ago and invited me to hunt turkeys with him on his place with Sweet Rachael, my 20 gauge flintlock turkey gun. Bill will be there to film again and, hopefully, things will turn out better this time. 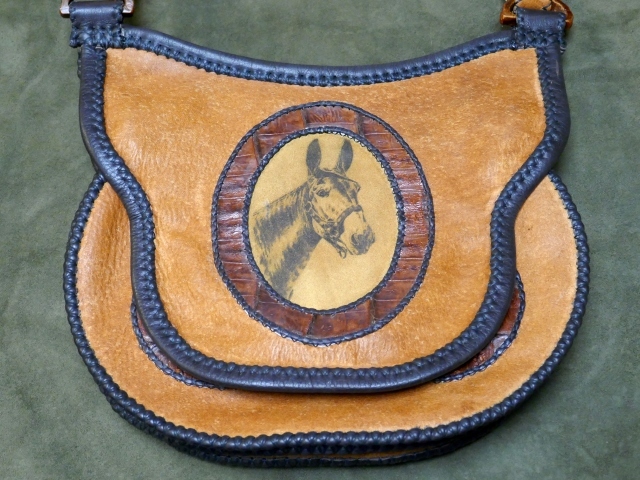 To show my appreciation for his hospitality, I made Joe this shooting bag. It has a springtime theme to it to get a feller in the mood for the season. I will give it to him next Sunday. I can hardly wait to see the look on his face! 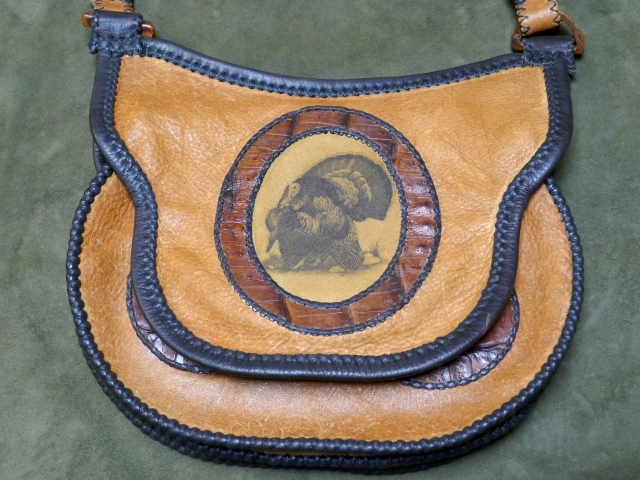 The body of the bag is elk hide and the trim is bison. 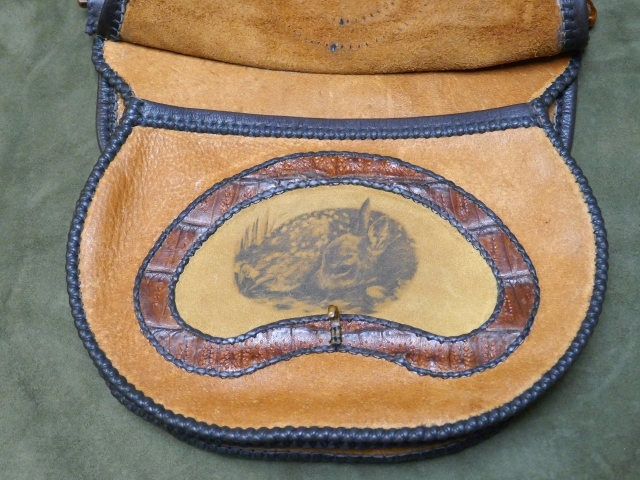 I found some pencil drawings I liked and had them laser etched onto some leather at Springfield Leather Company. I was going for the oldtime box camera photo look with the etchings so I framed them in caiman hide which looks like a wooden frame to me. 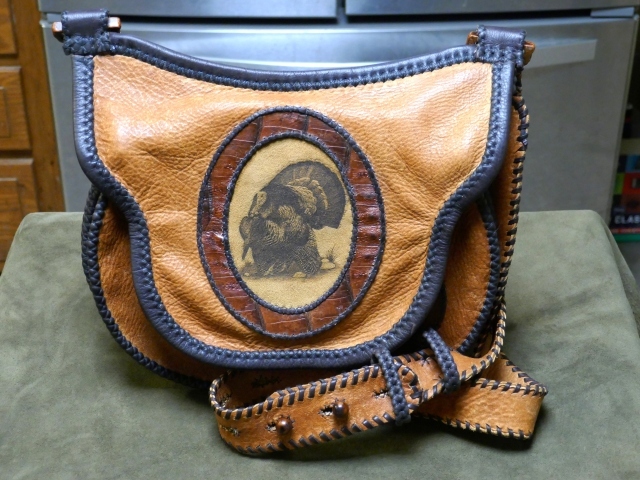 Everything was sewn by hand using artificial sinew. I was quite pleased with the end result. 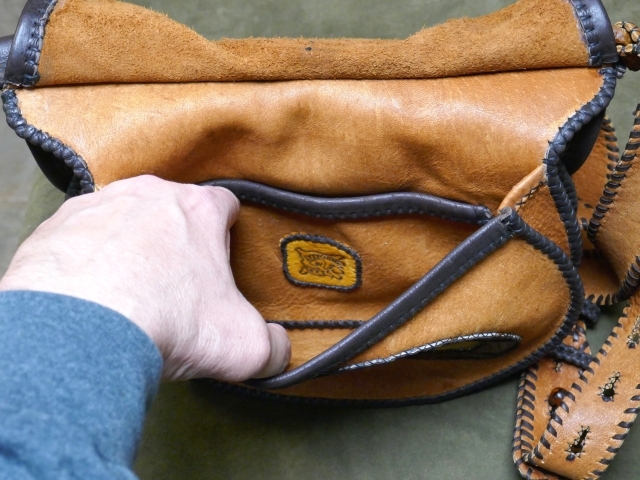 The bag is symmetrical with a large compartment and flap on both sides and a patch pocket on the inside of each compartment. This is the front flap. Inside the front compartment - I personalized it with Joe's initials. 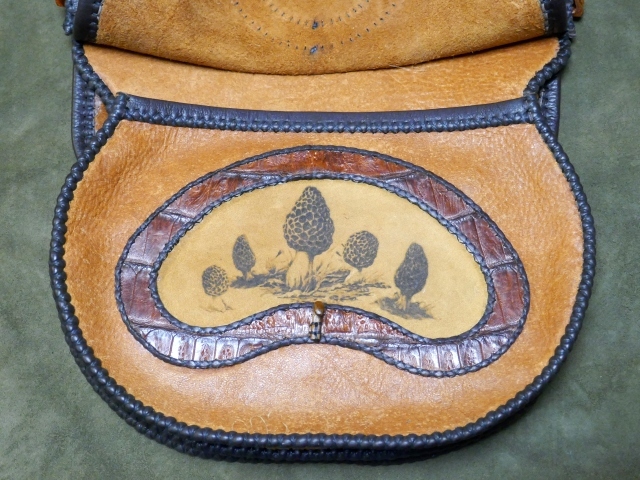 Back flap - Joe used to guide turkey hunters in the Devil's Backbone Wilderness Area using mules so I used this image to pay tribute to that. Inside the back compartment - had to put my maker's mark somewhere! 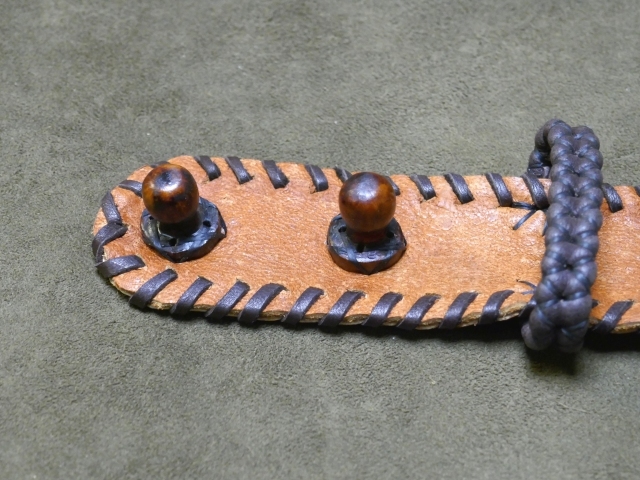 The D rings are carved from moose antler and the hooks and buttons are carved from deer antler. good golly! that's nothing short of STUNNING! Pretty much sums it up... as always! Nice, really nice work. 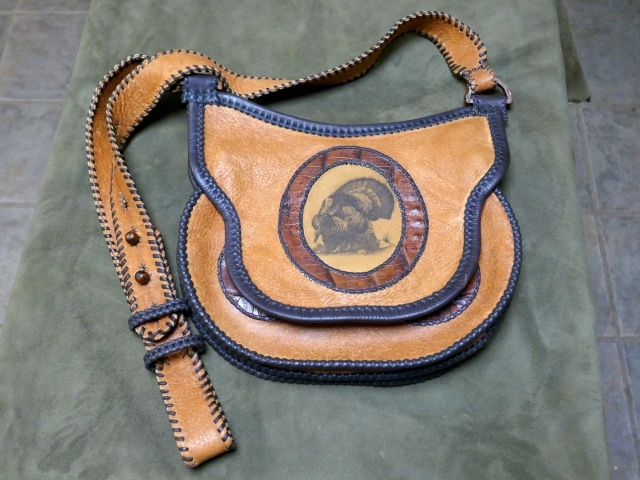 Cool bag. Lotta time and effort went into making that. A gift to be proud of for sure. Lots of hand stitching on that!!!! Amazing! 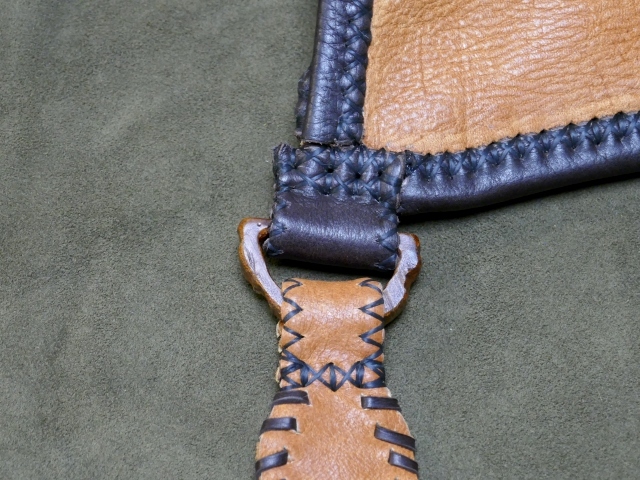 dhaverstick, your bags are absolutely amazing which look to me to require a lot of time and patience. You are indeed a true artesian! Thanks, all! 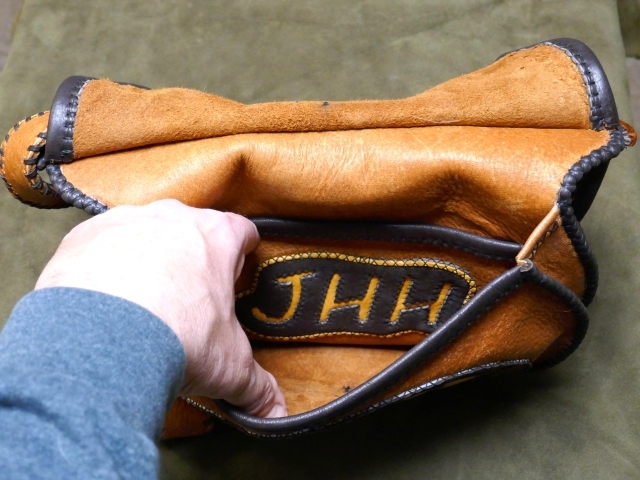 I gave Joe his bag last Sunday and it actually brought a tear to his eye. He hugged my neck and told me that I had no idea how much that bag meant to him. I couldn't have asked for a better payment than that! We hunted together for 3 days but were unable to get any gobblers to cooperate. Nevertheless, we had a great time. Here are a couple of photos taken by a mutual friend who put us together, Bill Cooper. The first one is Joe and me with Joe's mountain man toys. Despite how he looks, Joe is smiling on the inside. 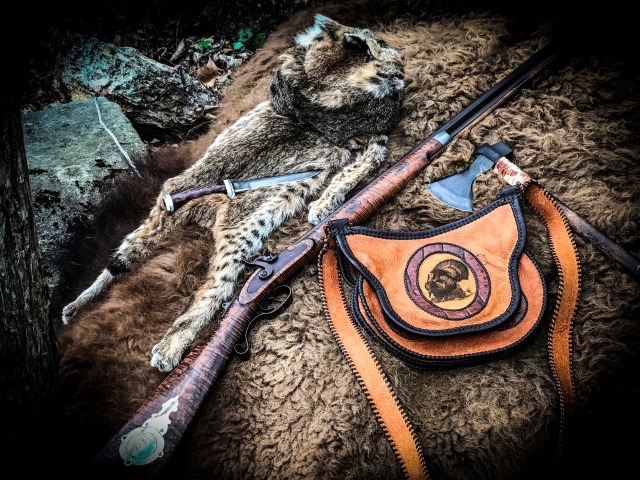 This is a cool photo taken by Bill of Joe's stuff; caplock rifle, hunting knife, hawk, shooting bag, and a bobcat hat that I had made for him last year.